Viceroy ran another very good race to finish a fast-finishing third in the Evening Star Handicap at Canterbury last night. Beaten for pace early in the race, Viceroy settled in the latter half of the field, but started to make his run at the 600 metre mark. The leaders were going strongly on the turn and Viceroy was giving them a healthy start. 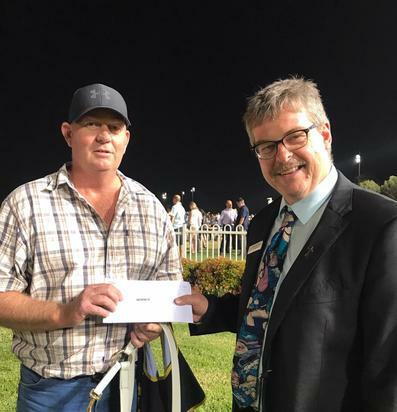 However, as a consolation, and a credit to Luke and Viceroy's strapper for the night Andy Bourke (who also drove the truck transporting Viceroy to Canterbury), Viceroy was awarded the best-presented horse for the night. It shows you can look good as well as perform well!